If you're in Zurich, head over to the Beyer Clock and Watch Museum, which presents the history of timekeeping and timekeeping instruments, from 1400 BC to modern times. On display, you'll find sundials, water and tower clocks, Renaissance automata, and pendulum clocks. And the Planetarium Table Clock featured above. 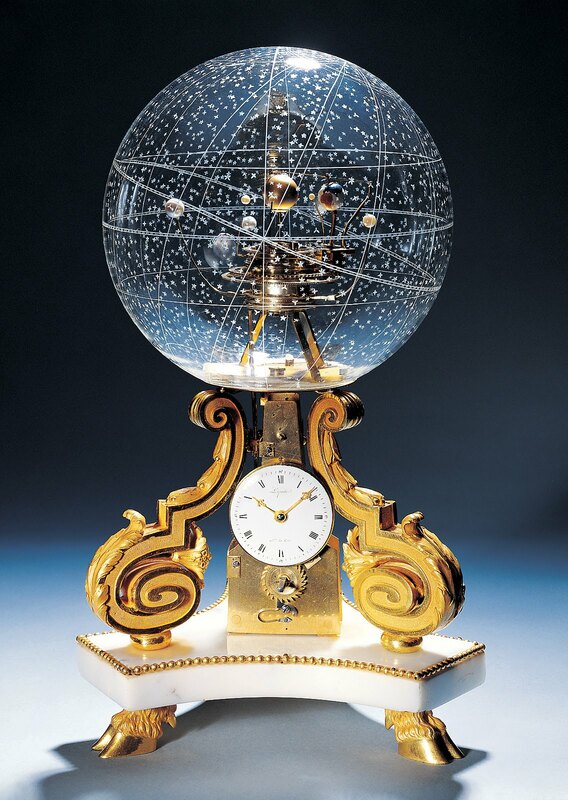 Made circa 1775, the planetarium clock keeps time ... and so much more. According to the Museum of Artifacts website, the earth (look in the glass orb) "rotates around the sun in perfect real time." And the "other five planets rotate as well--they "go up, down, around, in relation to the etched constellations of precisely positioned stars on the crystal globe, which if you are smart enough will reveal what season it is." This fine timekeeping piece was the joint creation of Nicole-Reine Lepaute, a French astronomer who predicted the return of Halley's Comet, and her husband, Jean-André Lepaute, who presided over a clockmaking dynasty and became horloger du Roi (clockmaker to the king). It's hard to imagine that the Planetarium clock didn't somehow inspire a more modern creation--the Midnight Planétarium, an astronomical watch that shows the rotation of five planets — Mercury, Venus, Earth, Mars, Jupiter, and Saturn. It has a price tag of $220,000 (excluding sales tax). See it on display below. Amazingly mind-blowing; a magnificent splendor!